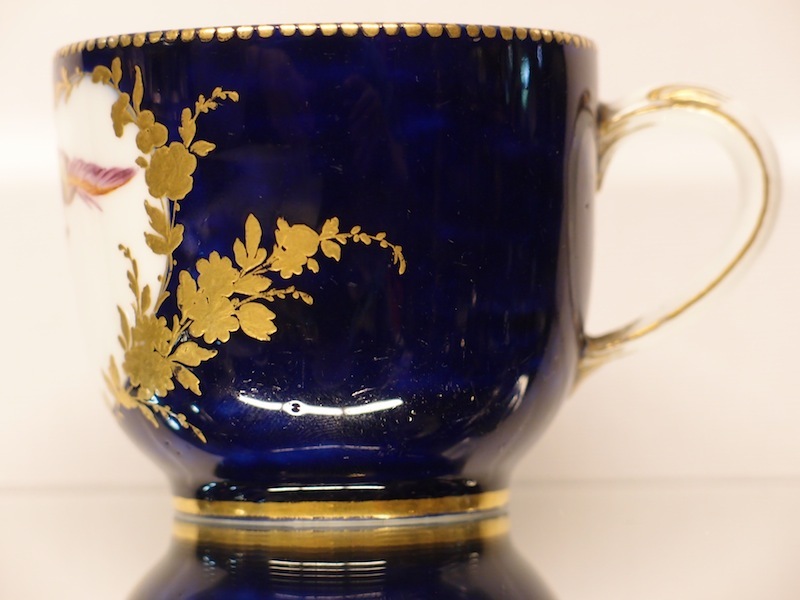 This wonderful cup is soft paste porcelain by Sevres. It bears the crossed Ls monogramme of the King, the factory's owner, the date letter for 1757, and the dagger for the famed ornithological painter, Etienne Evans. Evans was active from 1752 to 1806. A number of porcelain decorators started their painting lives as fan painters. Evans was one. The birds are in a white reserve within a floral gilt border. The ground is bleu lapis, and is very sumptuous indeed. Perfect condition. Similar works by Etienne Evans can be found in the Louvre, Musee des Arts Decoratifs, V&A, Metropolitan NY, Art Institute of Chicago, Museum of Fine Arts Boston and so on. The associated saucer is also Sevres but probably all or partly decorated in the 19th century, possibly specifically to match this cup. Comes free with the cup! 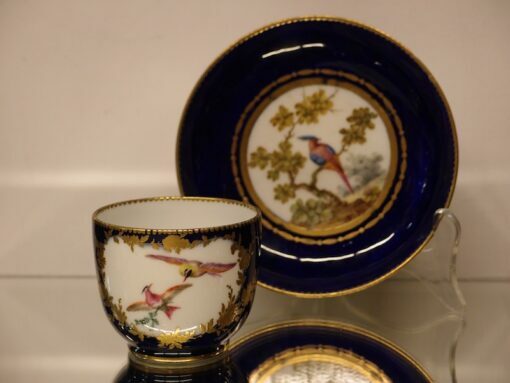 Lone Etienne Evans Sevres cups bring about $10,000, and cups with their saucers about $35,000 at auctions* so we are pleased to offer our loyal customers this bargain. *Auction prices are on public record with Mr Google, while shop selling prices are not. 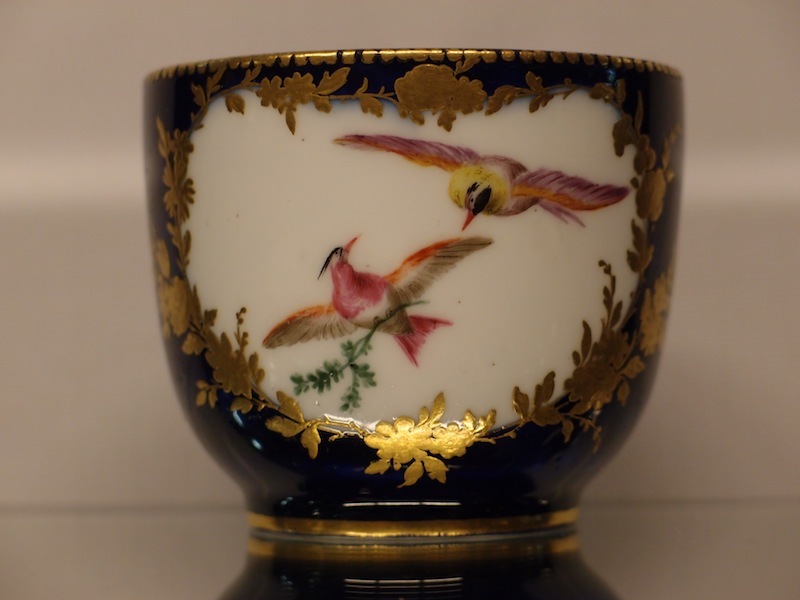 This wonderful cup is soft paste porcelain by Sevres. It bears the crossed Ls monogramme of the King, the factory’s owner, the date letter for 1757, and the dagger for the famed ornithological painter, Etienne Evans. Evans was active from 1752 to 1806. A number of porcelain decorators started their painting lives as fan painters. Evans was one. The birds are in a white reserve within a floral gilt border. The ground is bleu lapis, and is very sumptuous indeed. Perfect condition. Similar works by Etienne Evans can be found in the Louvre, Musee des Arts Decoratifs, V&A, Metropolitan NY, Art Institute of Chicago, Museum of Fine Arts Boston and so on.